The gourmet donut train has been full steam ahead in Vancouver for a while but I haven’t hopped on board. This past summer I had a gourmet donut that reeked of the oil it was deep fried in; smelling more like a Chinese savoury donut that goes with congee. It was not pleasant and made me wonder what the fuss was all about with these high-end donuts. Dispatched to retrieve a pie from The Pie Shoppe for my office’s afternoon coffee break, I struck out since it was Monday and the shop wasn’t open. Since returning without some sort of quality confection was NOT AN OPTION, I headed into Cartems as I knew these gourmet donuts would be a novel treat for the office. I was able to try enough of the Pear Compote and Citrus Dusted to offer an opinion. 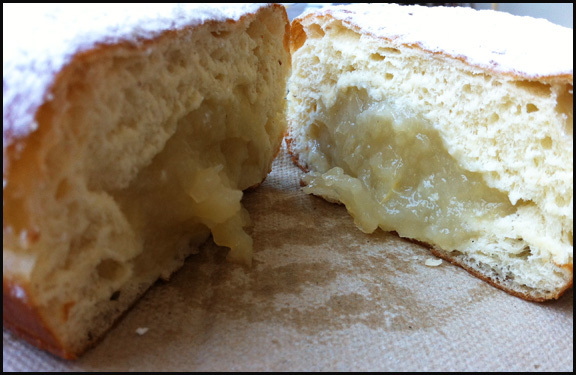 First off the Pear Compote donut didn’t smell like a Youtiao, but had sweet fragrance, which was appetizing. The donut itself felt hefty when held but each bite was airy and light. This yeast donut contained enough pear filling so that each bite contained some. The pear filling was the star. It tasted slightly sweet, had a faint spice to it, and exhibited the slight gritty texture that pears have. The powder sugar added just a pop sweetness that was complimentary to the filling. I liked the Pear Compote filled donut. 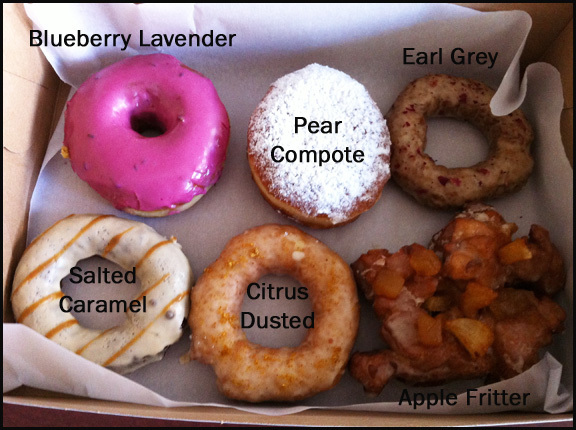 The Citrus Dusted donut was a cake donut and in comparison was a bit denser and sweeter than the Pear Compote. This donut had a sweet smell with a hint of citrus. The donut itself had a taste of citrus along with bigger hit of sweetness from both the sugar glaze and the donut itself. Much like the pear filled donut, this citrus donut felt heavy when I picked it up but each bite didn’t feel heavy. The Citrus Dusted donut was a very good but I think I prefer the Pear Compote filled as when given a choice I will always picked filled donuts. As for the other donuts, I only had nibbles of them so I can’t really comment on them. However my colleague loved her Salted Caramel and could not stop raving about it. The Apple Fritter was also a bit hit. Overall the donuts from Cartems were well received by everyone in my office. I still think this sweet round fried dough will still be a “once in while food” for me but when the craving calls, I definitely would like one from Cartems.